Blood disorders may be grouped as red blood cell disorders, white blood cell disorders, and disorders of hemostasis. Normal values for common blood tests are located on the inside back cover. Blood tests are valuable in diagnosing a variety of disorders. Note that many of the disorders described below are associated with abnormal values of blood tests. Nutritional anemia results from insufficient amounts of iron in the diet. Hemorrhagic anemia results from the excessive loss of RBCs through bleeding. Pernicious anemia results from a deficiency of intrinsic factor, which prevents absorption of sufficient vitamin B12 from the intestine to support adequate RBC production. Hemolytic anemia results from premature rupture of RBCs so that hemoglobin is released into the plasma. 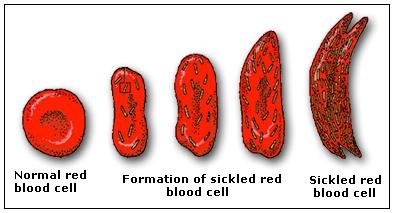 Aplastic anemia results from destruction of red bone marrow or its inability to produce a sufficient number of RBCs. Polycythemia is a condition characterized by an excess of RBCs in the blood. The excess RBCs increase blood volume and viscosity, which impairs circulation. It also leads to a increase in blood pressure, which can cause the rupture of blood vessels. It may result from cancer of the RBC-forming cells. Infectious mononucleosis is a contagious disease of the lymphoid tissue caused by the Epstein-Barr virus (EBV). It occurs primarily in young adults and kissing is a common mode of transmission. Three times more females contract the disease than males. It infects B lymphocytes, which enlarge and resemble monocytes. Symptoms include fever, headache, fatigue, sore throat, and swollen lymph nodes. There is no cure, but infectious mononucleosis usually persists for about four weeks. However, in some persons it may linger for months or years, and relapses may be frequent. Leukemia (lu-ke ‘-me-ah) is a group of cancers of the red bone marrow cells that form WBCs. It is characterized by an excess production of WBCs and the crowding out of RBC- and platelet-forming cells. Acute forms affect primarily children or young adults; chronic forms occur more often in adults. The various types of leukemia are classified according to the predominant WBC involved. Treatment usually involves chemotherapy and sometimes a transplant of red bone marrow from a compatible donor. Hemophilia is a group of inherited disorders that occur more often in males because they are X-linked. Hemophilia is characterized by spontaneous bleeding and a reduced ability to form blood clots. It may be caused by a deficiency of any one of several plasma clotting factors. There is no cure for hemophilia, but it is treated by injection or transfusion of the missing clotting factors. Thrombocytopenia is a condition in which the number of platelets is so low (<50,000/pl) that spontaneous bleeding cannot be prevented. Bleeding from many small vessels typically results in purplish blotches appearing on the skin. Thrombosis is the condition resulting from the formation of a blood clot in an unbroken blood vessel. Such clots tend to form where the lining of a blood vessel is roughened or damaged. They can cause serious effects if they plug an artery and deprive vital tissues of blood. Blood clots form more frequently in veins than in arteries, causing a condition known as thrombophlebitis, which is inflammation of the veins due to a blood clot. Sometimes, a clot formed in a vein breaks free and is carried by the blood only to lodge in an artery, often a branch of a pulmonary artery. A moving blood clot or foreign body in the blood is called an embolus, and when it blocks a blood vessel, the resulting condition is known as an embolism. An embolism can produce very serious and sometimes fatal results if it lodges in a vital organ and blocks the flow of blood.